Stump Cross got their Haslem Sheppard Halifax AFL title bid back under way with a 2-1 win away to Copley United on Saturday. Eight games survived the wet and windy conditions across the three divisions and Stump took advantage of playing at Savile Park, which drains quite well, in their first game for more than a month. They didn’t have things all their own way against their third-from-bottom hosts and Steve Fullard, Damian Watkins, Dean Lawrence and Tom Robinson all missed good chances. Stump, who had suffered a first league defeat when going down 4-2 to Ryburn in their previous match on December 6. took the lead when Robinson fired home from just outside the penalty area after 10 minutes. Ex-Sowerby Bridge player Richard Hirst equalised from close range following a corner just before half time. The winner came from Watkins on the hour but Stump’s failings in front of goal meant they were kept on their toes to the end. Stump boss Tony Kniveton was relieved to get another win under his belt and said conditions had made things difficult. On the title race he said: “There is a long way to go and I am sure there will be plenty of twists and turns. Northowram went second with a 4-3 home win over Calder ‘76. Playing with the slope and a very strong wind, the Rams went ahead after seven minutes. A ball over the top found Mark Eade and although he lost possession, the ball broke to Chris Conroy, whose cleverly-judged lob put his side one up. The Rams had by far the better of the play and chances, Karl Amos hitting the bar and Eade and Alex O’Keefe being off target. The closest Calder 76 came in the opening 30 minutes was Remi Allan’s floated attempt which passed narrowly over the angle of post and crossbar. In an eventful final five minutes of the half, Conroy won a free kick and from his delivery, O’Keefe’s smart glancing header doubled the lead. Home ‘keeper James Bunn was quickly off his line to block Calder’s best chance before Allan’s tap-in at the back post sent the visitors from the field in a visibly confident mood. The visitors stepped up the pressure but the Rams were far from reduced to purely defensive duties and took the lead after 70 minutes with Eade’s penalty after Chris Dunne had been brought down. Calder hit a post and Conroy put a one-on-one chance over the bar. Calder became increasingly frustrated with the referee’s offside decisions and fell 4-2 behind 10 minutes from time when O’Keefe’s pace took him past a defender and his low cross was converted by the sliding Conroy. 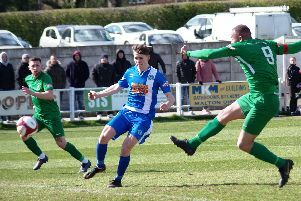 The visitors were far from finished and four minutes from time Bunn’s mis-kick landed at the feet of Topham who hammered in via the underside of the crossbar. There had been a fracas earlier in the game and, in the closing minute, a reckless challenge from one of the visitors saw players from both sides gather in animated fashion and the referee blew for full time. Northowram went second, above Greetland, who were held 2-2 at Ryburn United. Carl Ainley struck twice for Greetland but George Turner and Alex Coburn ensured that honours finished even. Four games took place in Division One but the meeting of the top two, Holmfield and Mixenden, was off. Salem moved to within one point of Mixenden, from two games more, thanks to a 2-1 home win over Ryburn United Reserves. Tom Neville and Lee Worrall scored for Salem with Richard Redhead replying. Midgley United Reserves are up to fourth but were made to sweat by Greetland Reserves, who came within 15 minutes of picking up a first point of the season, at the 15th attempt. Midgley played well for the opening 30 minutes in a game played in a strong cross wind at Goldfields, Greetland. Toby Standring and Jake Shaw both rattled the woodwork and when Tom Booth missed a couple of chances they started to get anxious. So they were relieved when James Yates struck a low 20-yarder into the net after 75 minutes. Craig Gladwin’s hat-trick helped AFC Crossleys end a form slump at home to next-to-bottom Halifax Irish Centre. David Mlodecki and Nathan Sloane were also on target in a 5-3 success, Craig Eastwood (two) and Steven Mitchell scoring for the visitors to Mason Green. A Gav Martin hat-trick helped Calder ‘76 Reserves beat visitors Stainland United 3-1, Jack Whitton getting Stainland’s goal. Illingworth St Mary’s are top the table for the first time in their short history. They have been playing catch up with their fixtures, due to a good Halifax FA Cup run, but beat visitors Shelf United Reserves 4-1 in the only Division Two contest to go ahead on Saturday. Their ninth straight win, on the 3G pitch at Trinity Academy, came with the help of a hat-trick from Joe Griffin. He opened the scoring mid-way through the first half after going one-on-one with the keeper. A stretching Dec Rothery shot over from close range and ‘keeper Adam Curry denied Shelf on a couple of occasions. Griffin made it 2-0 from a tight angle but James Hurtley pulled one back from the penalty spot. Griffin completed his three-timer and Rothery headed home a long throw from Nicky Bell near the end.